The ECS/Elitegroup NFORCE4-A939 is the cheapest nForce4 based motherboard available here in Europe. Although in contrast to the price, the overclocking options and the overall build quality of this board are both really good and far away from appearing cheap. This makes it the perfect victim for some voltmodding action. Adjust all the potentiometers to the maximum resistance. Those are the values to start with - they are very important! For all mods the rule is: The lower the resistance on those potentiometers, the higher the voltage. So make sure you checked if maximum resistance is set before powering up for the first time after doing the mods. 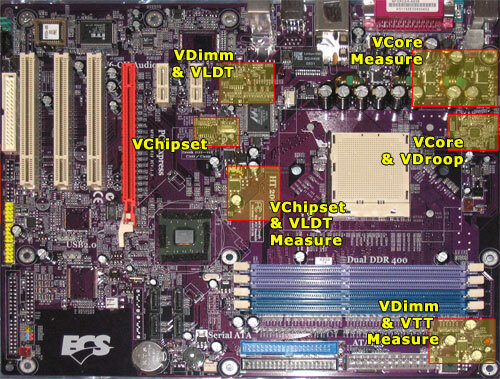 This should give you a rough overview of where to find the specific chips, needed for the modifications.